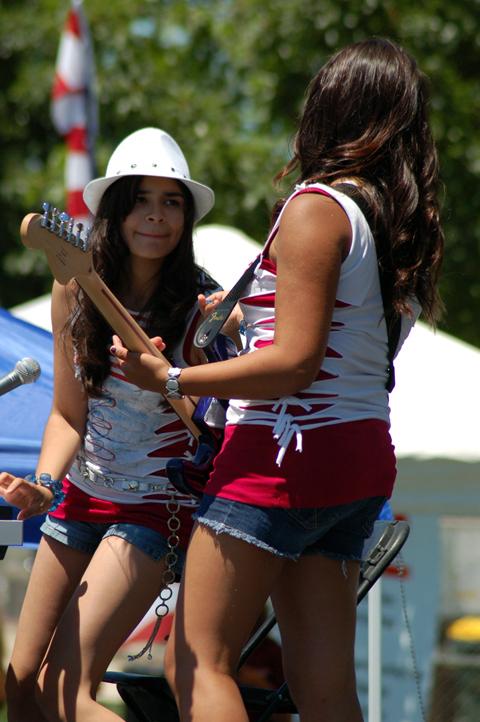 See our tuition rates for music lessons, lesson samplers, classes, and festivals. Yes. We have adult students studying voice and a variety of instruments, and we have several ensemble opportunities for adults. We hold several adult-only recitals per year, where our adults perform for each other and their families in a small, fun gathering with cheering and occasional impromptu jam sessions. What if my child wants to change instruments? Your child may change instruments at any time, so long as we have at least 24 hours’ notice in the event that a teacher change is required (although, most of our teachers are skilled on a variety of instruments, so you may not even have to switch teachers.) We recommend sticking with an instrument for at least a month after it gets difficult or frustrating, just to make sure the student isn’t simply stuck on a difficult concept. For example, piano lessons get more complicated when students learn to play both hands at the same time, and then again when students learn to move their hands on the keyboard. Each new level of complication introduced in lessons has the potential to cause a student to lose confidence and give up. We suggest sticking it out long enough to make sure it’s not just a new skill that’s frustrating, and not the instrument itself. What is the right age to begin private lessons? Students can begin studying piano, violin, or drums as early as age 4. 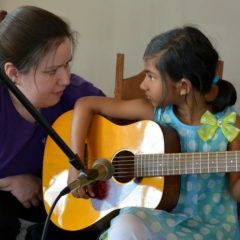 For guitar, we recommend waiting until age 6 because little fingers hurt when they press guitar strings, and students get frustrated and give up when it hurts. Band instruments are typically introduced around middle school, in the 5th grade. For voice, we recommend starting at age 6, when the child is old enough to read song lyrics. Many voice professionals recommend waiting until age 8 or even as old as age 13 to begin private voice lessons, because voice lessons can damage the voices of young children. However, this risk only exists when children are taught to project (sing loudly enough to be heard) or to stretch their range (sing higher or lower than they are currently able.) Our young singers always perform with a microphone and are never taught to project, and we don’t work children’s ranges. Instead, we focus on reading music, pitch accuracy, performance etiquette, and feeling comfortable singing in front of an audience. Please note, these are only minimum recommended ages. You can learn to play at any time in your life, so long as you have the desire to learn, the instrument to practice on, and the motivation to practice. Is participation in recitals required? We strongly encourage all our students to perform in recitals. We recognize that some students get physically ill from performance anxiety, and we understand and respect that. In all other cases, students should be encouraged to overcome performance anxiety and give it a try. Parents and teachers use recital performances to gauge improvement over time. Also, nothing gives students quite the motivation to practice as an upcoming recital. Is there a dress code for recitals? for parties? Tuition is due by the 1st of each calendar month, prior to the month during which lessons will be taught. For example, your tuition for lessons in the month of September is due on September 1st. We will invoice you on the 15th of the prior month (in the previous example, August 15th) to give you two weeks’ notice that tuition is due. We accept cash, check, and credit cards except American Express. We offer monthly autopay using any credit card, in which we will automatically charge your account balance to your credit card on the due date. We can take credit card payments over the phone. You may also pay online using PayPal to pay any outstanding balance on your account or click the “Pay Online” button at the bottom of your emailed invoice to pay that specific invoice. What if my child dislikes his/her music? Please tell us about this right away. Children are much more likely to practice if they enjoy the music they are working on. We can provide your child with popular music to supplement his/her lesson book. Your child should practice every single day. You can’t train for a marathon in a day; you train by running a little every day and gradually improving. Playing musical instruments and singing are athletic endeavors – they require muscular strength and dexterity, which only comes with gradual, repetitive practice. We would rather see your child practice for five minutes every day rather than cramming it into an hour before your lesson each week, even though the hour is technically more practice time. Require that the child play through his/her piece(s) at least three times without error, or at least five times in total if the student is still struggling with errors. Offer a reward for meeting the goal. Also, try scheduling practice time during a time in which the child is bored anyway, such as waiting for the bus in the morning, or coupling practice time with daily homework. does your child know where to place his/her hands or hold the instrument properly? is your child looking at the music on the page (correct), or just at the instrument or his/her hands (incorrect)? does the piece sound the same/similar each time your child practices it? are the number of mistakes decreasing each time your child practices? is your child playing the song faster and with more confidence each day? Rhythm/Meter: Am I playing the correct rhythm? If not, can I clap and count the rhythm properly. Do I understand the meter? Pitch/Hand Position: An I playing the right notes. (key signature, accidental) Are the notes in tune? Style/Tempo: Am I observing the markings (staccato, slurs, dynamics, etc.) in the music? Can I play the music at the appropriate tempo and maintain the style of the piece? The purpose of practice time is to exercise the muscles used in making music. Practice time increases strength and dexterity. As your child practices, he/she should be playing the song faster and with more confidence. It’s okay if your child practices the song incorrectly. We will fix that during the next lesson. It’s also okay – and completely normal – for your child to make many mistakes while practicing. Try not to point out mistakes or explain how the song is supposed to sound. Practice is when mistakes are permitted. If you regularly point out mistakes during practice, your child may feel like he/she is performing for you (rather than practicing) and not capable of performing correctly, which may decrease his/her confidence. Depending on the age and independence of the child, it might be better to allow your child some privacy during practice time. Computer lab is required for all students under the age of 18. Adult students are not required, but are strongly encouraged to attend computer lab. Students learn to play much faster if they train their ears, practice their rhythms, and learn how to read the music more quickly and proficiently. Music performance involves a large amount of multitasking: musicians must understand what the notation on the page means, how it translates to the instrument in their hands, how to position their fingers, feet, or mouths to create the sound on the page, how long to hold the note, how loudly to play it, how to incorporate articulation markings, and how to make it musical as well as technically correct, all at the same time. The faster a student’s brain can interpret and translate what they hear and see, the better she will play. The more accurately a student’s ear is trained to recognize whether the notes he is producing matches those on the page, the better he becomes at learning to play it correctly. Computer lab helps some of these elements become automatic in a student’s brain. What if my child doesn’t like computer lab? Please let us know right away. Our lab attendants will address the problem. Chances are, your child either finds the content too easy and is bored, or finds it too difficult and is frustrated. We can isolate the problem and either help your child with difficult concepts, advance to a harder level, or switch to a different computer program altogether. In rare situations, students who suffer from anxiety may struggle with timed tests and can be placed on a non-timed curriculum. However, please note that computer lab is required for all children under the age of 18. 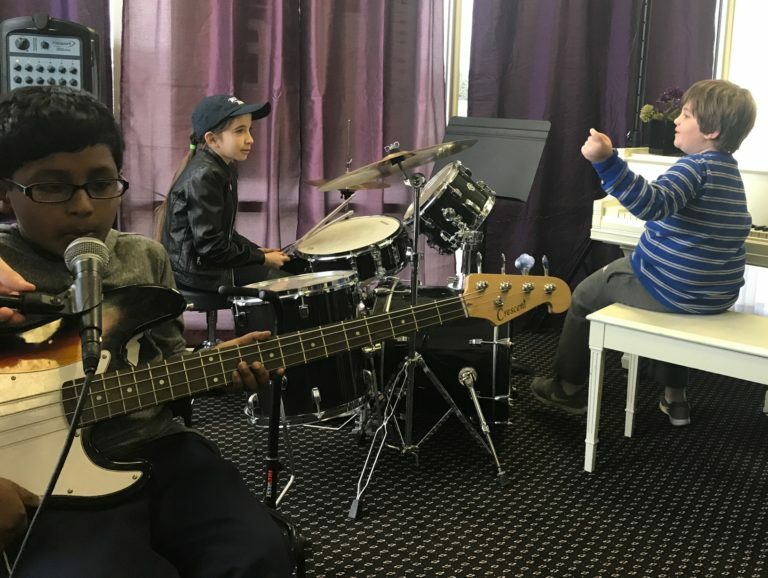 We take your child’s music education very seriously and believe that a solid foundation in music theory, ear training and rhythm training is essential for continued growth as a musician. What if my child really wants a male/female teacher? We are happy to accommodate teacher requests. Please be advised that we occasionally cover teacher absences with substitute teachers. If you arrive to find your child’s lesson with a teacher he/she is uncomfortable with, we will reschedule your lesson. What if I need to change lesson days? You may permanently reschedule your regular lesson at any time with 24 hours’ notice. Do you give make-ups and when? We require 24 hours’ notice to schedule private lesson make-ups for schedule conflicts. For emergency or illness, we will schedule a make-up lesson for private lessons only, so long as we receive notification prior to your lesson time. No-call/no-shows will not be made up for any reason and are non-refundable. Missed classes cannot be made up for any reason and are non-refundable. MTMS will be closed in the event of a Level 2 Snow Emergency in Franklin County (Gahanna Campus) or Delaware County (Polaris Campus). In the event of inclement weather, we will post our status on the front page of our website. If you are experiencing bad weather in your area and cannot make your lesson, we will make up your private lessons if you call prior to your lesson time. As always, we do not reschedule classes. I think that you have an excellent program, flexible schedule, and nice waiting area. We would definitely come back to lessons in the future and I recommend your studio to other people all the time. – Sara H.
Our daughter Addison is seven and interested in music lessons. We aren’t sure what instrument to start her with, we are wondering if there’s a class or a time that we could bring her in to try a couple different things. We are interested in the Lewis center location. Thanks!